Don’t mess with Ruth Roman – or her wardrobe. This is the cynical view of The Far Country, a 1954 Western starring James Stewart and Ruth Roman. It’s a Western with a twist. Instead of men driving cattle across a dusty landscape, men drive cattle across the chilly tundra. It’s also a cautionary tale about monopolies that thrive by squeezing out the little guy. In The Far Country, Stewart is a cowboy who, along with his partner (Walter Brennan), ships a herd of cattle to Skagway during the Klondike Gold Rush. They intend to drive the cattle across the Canadian border to Dawson, where they’ll sell the beef at a tidy profit. 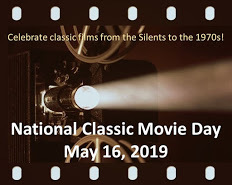 But when Stewart and Brennan arrive in Skagway, they clash with a mercenary sheriff (John Mcintyre), a defiant man who controls local market pricing and the supply route to Dawson. Nobody in this town makes money without paying him a share, even if he did none of the work and carried none of the risk. He’s a bossy, expensive freeloader. The other Captain of Industry in town is Roman, to whom Stewart is attracted. Roman is an entrepreneurial femme fatale – a woman who understands vice will always be the most lucrative business. Her establishment conducts all sorts of activities, such as drinking, gold trading, card playing and, uh, social opportunities with young ladies. There’s always more money to be made, and Roman is expanding her business across the Canadian border. The good citizens of Dawson are not happy about the influx of disruptive Americans but, with a shortage of manpower, there’s little local officials can do. To Sum: No police + Lots of gold = Roman’s perfect business environment. In examining Roman’s character, we must examine her wardrobe. She almost exclusively wears gowns; in-your-face expensive gowns; gowns that would need a team of people to upkeep. She wears them for Political Reasons. No other female character in this film can afford such attire; the other women live hardscrabble lives. And notice the ground in this film. Floors are caked in sawdust and Dawson’s streets are canals of mud. You’d have to be crazy – or very rich – to schlep around in such a get-up. Yet, in every scene, Roman’s hems are mud and sawdust free, which sets her apart from everyone else. Her pristine hems tell you she’s above every one and every thing. Nothing can touch her; just you try. Here’s a snapshot of Roman at work: Once Stewart and Brennan arrive in Dawson with their cattle, the town is ecstatic. “I’m gonna get me a steak about 10 inches thick,” says one man. The woman who runs the local eatery approaches Stewart about the price of his beef. She offers $1.00 a pound, and is immediately outbid by Roman, who drives the price so high only she herself can afford it. If folks want a 10-inch steak, they’ll be paying her for it. The Far Country is an absorbing film in many ways. Firstly, the exteriors were shot in Canada’s Jasper National Park, including scenes that were filmed at the famous Athabasca Glacier. Secondly, it has an absorbing plot, one that chronicles the effects of corruption. Director Anthony Mann brings a noir edge to the film, where powerful (business) gangsters make all the rules with little thought for human life. Thirdly, Roman and Stewart are great sparring partners. Stewart’s character, like many of his post-WWII roles, is a bitter man who wrestles with his motives. Roman, on the other hand, never loses sleep; she bases every decision on The Bottom Line. With the themes it explores, The Far Country is still a relevant film that deserves more attention than it receives. We encourage you to see this lesser-known gem. The Far Country: starring James Stewart, Ruth Roman, Corinne Calvet. Directed by Anthony Mann. Written by Borden Chase. Universal-International Pictures, 1954, Colour, 97 mins. 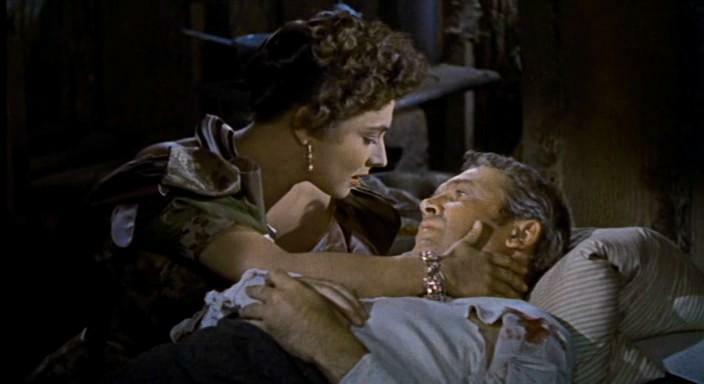 Silver Screenings talks about a very heavy weight actress Ruth Roman in The Far Country! Excellent review of a riveting movie. Side note: When the hubby and I are making the grocery list and we need coffee, he will go into his Walter Brennan impersonation about how he can’t get along without his coffee. We know how that turned out. Haha! That’s terrific! I love that your husband would do the Walter Brennan impersonation when it comes to coffee. Someone in my house completely agrees with Walter’s views. Yes, I love Anthony Mann westerns. They’re really tense and thought provoking. And Sunday it is! I hear those enhanced soundtrack chorus frogs whirring outside my window!!! Ahhh THEM!!!!! Is it just me or are Klondike Westerns always the weirdest and most garish westerns? I love the description and explanation you’ve put in about Ruth Roman’s wardrobe here. It could really be the description and explanation for every fabulous lady in a Klondike Western. I mean, have you seen that one with Gypsy Rose Lee and Dinah Shore? If you didn’t need glasses before seeing that one, you’ll certainly need them after because those costumes will damage your eyes! Haha! 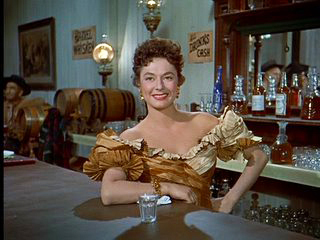 Yes, you’re right – Ruth Roman’s wardrobe could be the remplate for every female wardrobe in a Klondike Western. I’ve not see the one you’ve mentioned with Gypsy Rose Lee and Dinah Shore. Will have to watch for that one. Reblogged this on I Found it at the Movies. Great review. Love that title, Klondike Crime Boss! Ruth Roman deserves more attention. She’s in a great little thriller with Sterling Hayden, Five Steps to Danger. Ooh – thanks for the heads up re: Five Steps to Danger. Will watch for that one. I love all of the Anthony Mann-James Stewart Westerns, but THE FAR COUNTRY is probably my favorite. I can’t think of another Western that better examines the theme of civilization overtaking the frontier. It’s a great all-around cast; John McIntire makes a fine villain and Ruth Roman makes the ending work. It may be her best performance. Perfectly said, Rick – this really is the examination of civilization taking over the frontier. Isn’t John McIntire the best villain? He steals every scene. As for Roman, I agree that this could be her finest role. I like this one. As far as I’m concerned, it’s Roman’s best performance. She gets a chance to display her wit rather than just be a pretty face. So true! Roman proves she has a lot of talent in this film. Really, she is criminally underrated. Thanks! Ruth Roman and Jimmy Stewart are excellent in this film. Plus, you get to see Canada’s extraordinary scenery! Goodness – imagine doing anything in those outfits, let alone in the inhospitable Wild West. I’ve said it many times before – this is a genre I don’t naturally gravitate towards and I have far too little knowledge of. Thanks for reminding me to look outside my genre boundaries! You said it – those gowns are not the best attire for life in the Klondike. Roman’s gowns set her apart from all the other characters, like a rare jewel. I love Jimmy Stewart, and it was fun to read about one of his movies that I haven’t seen. The part about Roman’s dress describing her character as far a the lack of dirt on it was so interesting. I never would have thought of that. I would like to watch this movie just to see the Canadian scenery, but it sounds like it has a lot more than that to offer. Thanks so much, Ruth! I had just started reading your Bacon/Asparagus recipe when I saw your comment! 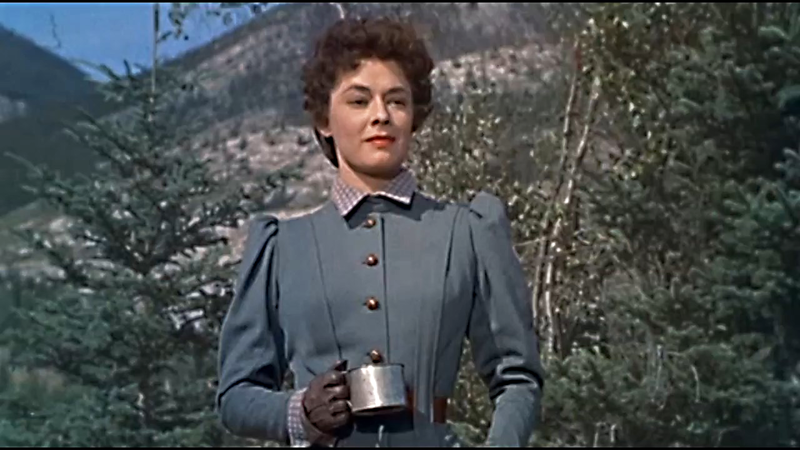 Yes, Ruth Roman’s dresses in this film are STUNNING…as is the Canadian scenery. It’s definitely worth a watch!